Within the next year, the intersection of Forest Park and Vandeventer Avenues – a crossroads between downtown and the Central West End, the Tower Grove neighborhoods and north city – might well look like any intersection anywhere. Anywhere but a hand-built older city, that is. 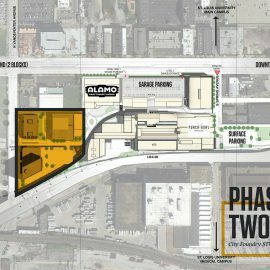 The alluring yellow-and-blue big box of IKEA will join with an anemic cement-board student apartment spread and a potential strip mall. The visual mess hopefully will draw design-minded citizens to start realizing that St. Louis can retire its low self-esteem mantra of “any development is good development.” Either that, or we can stop mocking Phoenix already. I am trying to impugn neither the economic benefits of retail sales taxes nor the impact of Saint Louis University students living in private housing near campus in the city. Nor will I lament the loss of the gas station and crackling asphalt dross that the new architecture replaces. In terms of utility, the developments around this intersection are beneficial. In terms of everything else, however, they set an abysmal standard for the new architecture of the central corridor. The IKEA store represents the largest missed opportunity for the city in decades, and its trite and hostile suburban form the most unforgivable design blunder since the St. Louis Centre skybridge occluded the daylight of Washington Avenue. St. Louis is a city that has a penchant for cleaving its better parts through shapeless commercial development along major streets. Here at a major intersection, IKEA and CORTEX are giving us a giant asphalt and concrete wedge that actually will worsen the pedestrian experience along its edges. At least now, undistinguished pedestrian-scaled buildings provide form and context. Soon, a great big nothing is coming. 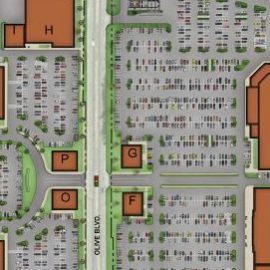 That nothing is the 700-car parking lot – replete with superfluous “outer roads” that might make St. Charles County groan – that surrounds the generic big box. Should any other retailer import suburban retail architecture to a busy central city intersection, we might hear sanctimonious cries against the design. Not IKEA. IKEA gets a free pass, because it supposedly is a needed cultural icon (now St. Louis is…a real city?) and an economic boon (well, at up to $10 per hour, anyway). IKEA’s signifying anything big-city is offset by the closure of Schnucks at Grand and Kossuth, and the continued lack of even the most basic grocery retailers in huge swaths of the city. The perverse nature of IKEA’s site is that the supposed symbol of our urbanity becomes a big retail box surrounded by surface parking – the exact image of St. Louis that shamefully embodies our resistance to actual urbanism. While Philadelphia, New Orleans and Buffalo offer walkable, human-scaled urbanism as actual experience and semiotic token of city identity, St. Louis continues to extol its own evisceration as an American city. Perhaps a 21-acre superblock should be St. Louis’ proudest accomplishment, but that is heavily disconnected from a city of Cherokee Streets, Old Norths and Tower Grove Parks. The failure of city government to leverage IKEA’s interest in the city for a better design sadly portends worse design may follow. Although the city lacks real tools – such as from-based zoning – to enforce architectural designs that enhance our commercial streets, make walking feel safe, and promote density needed to support mass transit, it has power over incentives. IKEA is entering a tax increment financing (TIF) district, and sharing revenues. City leaders met the request for TIF access with the old myopic scarcity mentality: if we don’t let IKEA do what they want, we’ll lose the store to Chesterfield. IKEA’s retail sales tax impact is not significant enough to justify non-existent pushback on the form and character of the store. The city could have at least mandated that the site plan comply with the CORTEX master plan, which shows multi-story buildings facing Forest Park Avenue. Instead of worrying what urban design traits make us competitive with Buffalo or Nashville, city leaders capitulated in fear of losing more ground to St. Peters or Fenton. This saga is hardly one of change and progress. Across from the IKEA crater, we have the built environment equivalent of one step forward, two steps back. 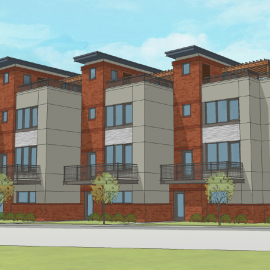 At the northeast corner of Forest Park and Vandeventer, Sangita is building the 164-unit apartment building named “The Standard.” A gas station fell to make way for a project offering the applause-worthy ingredients of completely structured parking, an urban form and no use of any public incentives. The free real estate market here seems to be delivering exactly what design the city needs in its burgeoning central corridor. The Standard’s first rendering had the affable, bland good nature of a student dormitory at a third-tier state college, but it at least offered a decent street-level interface with storefronts at the corner. At first glance, The Standard seemed the antidote to the suburban retail hells of IKEA and the proposed Midtown Station that hopefully will never besmirch the site across the street from The Standard. Then, the developers added water – the hipped roof went flat, the masonry cladding turned into cheap concrete fiber board, and the retail spaces disappeared. The new design of The Standard does not deserve an evaluation of its Vitruvian merits. Its failure draws my attention only to warn future designers who might try harder. The new building is cheap and forgettable – like 3949 Lindell Boulevard, like the buildings being built on West Pine, like the Aventura and like most suburban apartment complexes in the region. 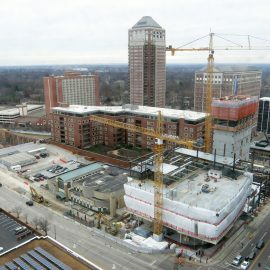 The project merely further extends the city’s recent penchant for not attaining excellence in apartment building design. Lou Saur’s 4545 Lindell Boulevard, with its resolute and context-sensitive concrete design, is the exception to a shuffle toward mediocrity. Yet even when the city has the tools to mandate central corridor development bring the city density and good design, we keep getting bad decisions. In April, the city’s Preservation Board approved by a 5-2 vote demolition of a two-story building at 4108 Lindell Boulevard (1948) to create twelve parking spaces serving the adjacent building, the historic Remington-Rand Building (1956; Hellmuth, Obata & Kassabaum). While the modest modern building at 4108 Lindell is not an exceptionally interesting building, it remains part of the street wall and retains ability to generate taxable business activity. On Lindell, the Lawrence Group – both developer and architect here – will renovate one building and demolish the other. The developer calls this a trade-off. What is being traded, however, is not just a minor modernist office building. The loss of 4108 Lindell Boulevard negates the entire purpose of the newly-adopted Central West End Form-Based Zoning Code. Preservationists like myself feared that the form-based code would threaten buildings like 4108 Lindell because it would encourage their replacement by sleek, contemporary high-rises. Ironically, we never feared surface parking lots – or the chance that 12 parking spaces could justify demolition under what seemed like a model form-based code. The problem with the Central West End zoning overlay is the same problem we have in the city’s planning and preservation ordinances to begin with: there are no standards for variance governing the Preservation Board or Planning Commission. These bodies are allowed to grant arbitrary variances, and that’s that. Any new city zoning code needs to be preceded by an ordinance that creates legal standards for allowable variances from urban design standards. Meantime, we will continue to get the same anarchy in regulated projects as we get in unregulated ones. For the foreseeable future, then, the developments across Midtown and the Central West End will not add up to a coherent vision for the look of the city’s future. We will get buildings that reflect the ambivalence of our laws toward coherence and our urbanist coalition toward architectural design. Scattershot projects with minimal design regulation cause momentary excitement, but leave lasting reminders of what happens without careful cultivation of good architecture. We cannot suborn considerations of design to purely political or economic terms (development is good, tax revenues are good). St. Louis needs at most a more rigorous citywide zoning code that mandates urban form. At the least, we need a civic architectural consciousness that allows us to be critical of the image of the city built by developers whose bottom lines don’t include great architecture. We must recognize that even in the era in which we spend more time looking at our smartphones than the exteriors of buildings, good design matters. We aren’t building retail square footage formulas, or convenience for urbanists seeking European furniture. We are building architecture that our eyes will encounter for decades to come. Every new building sets the tone for accepting the next, so each mediocrity begets another. Ada Louise Huxtable once wrote of Houston that “this is instant city, and it is nowhere city.” Looking over the dreadful revisions of The Standard and the IKEA site plan, this phrase echoed in my mind. 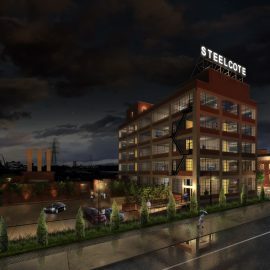 While the plastic-looking buildings in the renderings do not grossly offend, visions of these buildings in twenty years do – as do thoughts of the flood of equally cheap buildings to follow, and their collective power to make midtown St. Louis into a sunbelt-style forest of placeless, tasteless buildings smothering more desirable and unique buildings. Weed buildings, like weed trees, are invasive. Yet in genial digital rendering they fool us – they don’t look like ghetto palms, just undernourished oaks or hickories. Saddest of all is that the intersection of Vandeventer and Forest Park had an elegant architectural canopy until three years ago. CORTEX foolishly wrecked the old Welle-Boettler complex at the northwest corner, which set a strong standard for materiality, scale, form and density. That building survived nearly 120 years to be lost to a sea of buildings that might survive 40 years at most. The Gerhardt Block from 1896 to the north remains, poised for rehabilitation, silently setting itself up for a long vigil. Permanence shatters to transience all around the stately old commercial row, which was so clearly built for the pedestrian. A city of Gerhardt blocks turned national eyes and enjoyed great shared local wealth. A city of what comes next ought to do the same, but so far, it has not.